For those who haven't been closely following Ecuadorian politics over the last few years, former President Rafael Correa's tweet lambasting his successor, Lenin Moreno, as "the greatest traitor in Ecuadorian and Latin American history" may have sounded excessive or unfair. But understanding what caused the the relationship between the two leaders to deteriorate to such a degree is helpful for understanding why, after seven years, Ecuador decided to surrender Julian Assange and cancel his citizenship, and what role the US played in this decision. While much of the coverage of Assange's arrest has focused on trivialities like Assange's hygiene habits or who is going to take care of Assange's cat, the Wall Street Journal has delved into the geopolitical considerations that informed Moreno's decision. Bottom line: Under Moreno, Ecuador has abandoned its wariness of the US and has instead pursued closer economic ties. This shift enraged Correa, who believed granting asylum to Assange was a great way to annoy and antagonize the US. During the opening months of Moreno's presidency, a bitter rift started to develope between the two men. 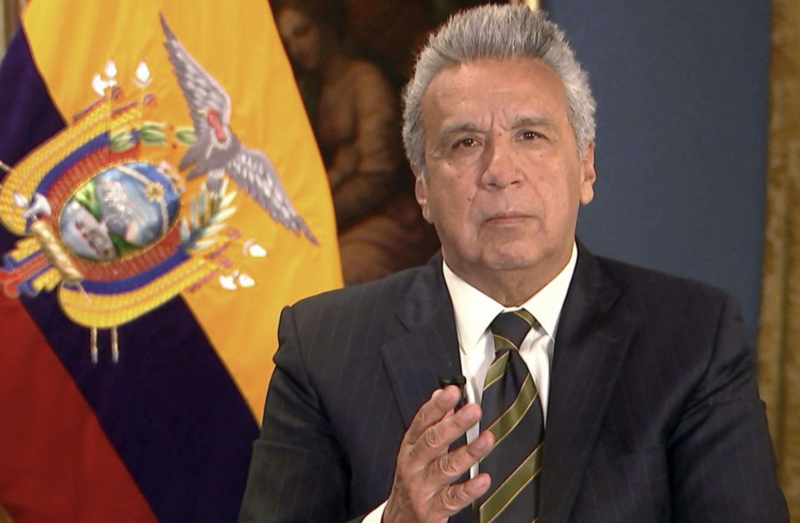 Tensions between Ecuador and Assange started to develop toward the end of Correa's tenure, when, after Wikileaks started publishing hacked DNC emails, Correa temporarily restricted his access to the Internet. This was the start of a long and well-documented period of intensifying acrimony between Assange and his hosts that ended with Ecuador introducing a stringent set of rules for Assange, including prohibiting him from commenting on anything involving global affairs. As the Guardian reported, Moreno viewed Assange as an inherited nuisance and "an impediment to better relations with the United States." Moreno's desire to foster a better relationship with the US was central to his treatment of Assange. But when the decision was made to turn him over to British police, the US was apparently dangling a powerful incentive in Moreno's face: A trade deal with the potential to transform the country's small but rapidly growing economy. For this reason, it is believed, Moreno distanced Ecuador from Venezuela, Bolivia, Cuba and other members of Latin America's leftist bloc. Last year, after Ecuador restricted Assange's Internet access, Vice President Mike Pence visited with Moreno to discuss the worsening crisis in Venezuela and possible progress toward a trade deal. For this reason, many believe that Ecuador likely consulted the US before deciding to end Assange's asylum. "I think it is very unlikely they didn’t talk to the U.S. first" about ending Mr. Assange’s asylum, said Sebastian Hurtado, president of Profitas, a Quito political-risk consulting firm. After seven years, the Assange drama has also worn down the patience of the Ecuadorian people. As one analyst told WSJ, his expulsion was something that "many people thought was coming". "This was something that many people thought was coming and at a time when Ecuador is really trying to get closer to the U.S. it makes sense," said Michael Shifter, president of the inter-American Dialogue, a think tank. Ecuador's business community greeted news of Assange's arrest with enthusiasm. "Most people are ok with just having this guy leave the embassy, finally," said Mr. Hurtado, the analyst. "What I always wondered was why they took so long." In a few days, Moreno will be welcomed to Washington. Is the timing of this meeting so soon after Assange's arrest just a coincidence? We think not.